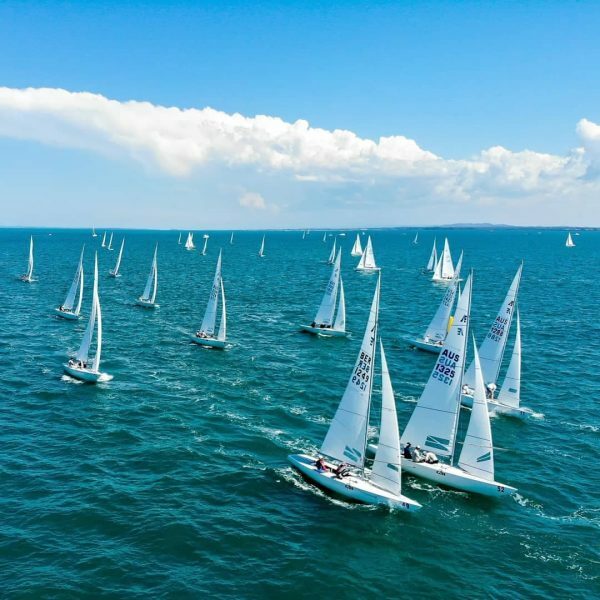 Etchells World Championship – RQYS Members in Podium Positions! Saturday saw the end of the 2018 Etchells World Championship at RQYS, after a week of light, shifting conditions and challenging world class racing. In the end it was Aussie competitor Lisa Rose who emerged as the new Etchells World Champion. Congratulations to skipper Martin Hill and crew of Julian Plante, Sean O’Rourke and RQYS Member Mathew Belcher on a consistent regatta performance with seven top 10 finishes. Second and third places were separated by only two points, with RQYS competitor Gen XY vying for the silver spot. But ultimately it was Hong Kong competitor Racer C skippered by Mark Thornburrow accompanied by crew Mike Huang, Alexander Conway and RQYS Member Will Ryan who took second place. Gen XY placed third, which is an exceptional result for Squadron Sailors Matthew Chew, Brian Donovan, Ben Vercoe and Ashley Deeks. There was pride amongst all sailors at the presentation, followed by a long night of partying, which shows the great class spirit of the Etchells during thier time here at RQYS. Well done to all of the Etchells Competitors for a hard fought regatta and thank you for making the 2018 Etchells World Championships a new highlight in our Squadron’s history. We wish all the sailors the best of luck in their next on-water endeavours. I am writing on behalf of the Flag Officers and Committees of the Royal Queensland Yacht Squadron to personally compliment and thank members and volunteers for supporting the 2018 Etchells World Championships at RQYS. The Brisbane Etchells Fleet who had the vision to bid for the event and deliver. C/D Row berth occupiers relocating to allow all entrants to moor in one area. Measurement Team members who did hull and sail measurements, especially the hull team who worked in some tough weather conditions. The crane Marshalling and Traffic Direction Team who also worked in some tough weather conditions. The Registration Team who packed bags, checked details and weighted crews. The Tow Boat Team who spliced tow lines and made their boats available to tow boats to and from the race course. The on Water Team who delivered the full schedule of races. The Jury who dealt with several difficult matters. The generosity of members who kindly offered their vessels and time to wholeheartedly support the Regatta. I would also like to recognise the contribution of Squadron staff in all departments who worked tirelessly throughout the event to make sure the Squadron delivered a first class Regatta on and off the water. The unsolicited complimentary feedback I have had from regatta competitors and visitors has been overwhelming. Once again thank you for your contribution to the event.